Tokunai Pass (都区内パス) is a one-day pass good for travel on JR lines anywhere in the 23 wards of Tokyo (including the entire Yamanote Line and many stations surrounding it). It costs ¥730, making it economical if you plan to make five or more train hops in one day. The Tokyo Free Kippu (東京フリーきっぷ) covers all JR, subway and city bus lines within the 23 wards. It costs ¥1,580 for one day, and covers a number of areas that are not served by JR, such as Roppongi and Odaiba. Tokunai Pass (都区内パス) is a one-day pass good for travel on JR lines anywhere in the 23 wards of Tokyo (including the entire Yamanote Line and many stations surrounding it). It costs ¥730, making it economical if you plan to make five or more train hops in one day. The Tokyo Free Kippu (東京フリーきっぷ) covers all JR, subway and city bus lines within the 23 wards. It costs ¥1,580 for one day, and covers a number of areas that are not served by JR, such as Roppongi and Odaiba. Kappabashi Street (かっぱ橋道具街, Kappabashi Dōgugai) is a shopping street between Ueno and Asakusa, which is lined with several dozens of stores selling everything needed by restaurant operators, with the exception of fresh food. Ueno Park & Museums - May take up to a full day visit on itself. Open 9.30am-5.30pm tue-thur, sat, sun; 9.30am-8pm fri. Admission ends 30 mins. before closing time. 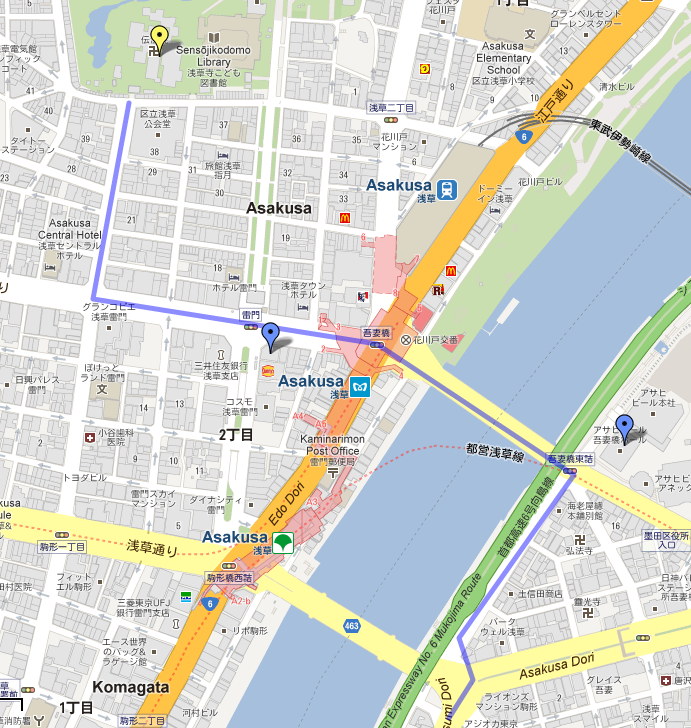 Getting Here: 5 minutes by bus (or 20 minutes on foot) from JR Sotobo Line Toke Station, the nearest train station. To Toke Station, transfer at Chiba (JR Yokosuka Line or Sobu Line) or at Soga (JR Keiyo Line) if you come from Tokyo Station or the Tokyo metropolitan area. Take a bus bound for Asumigaoka Bran New Mall at the Chiba Chuo Bus Minami-guchi Terminal No. 3 located outside the South Exit of Toke Station. Stop on Asumigaoka Higashi 4-chome.